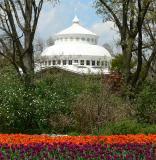 The Cincinnati Zoo & Botanical Garden opened in 1875, is the second oldest in the United States. annual Zoo Blooms is the largest collection of Tulips in the Midwest. I remember being scared of the alligator (or crocodile) pits - a concrete circular wall you looked down into. Loved the train. This was in the late 1960s! i saw a picture in a shop that was not for sale. it was a cincinnati zoo picture collage. it was beautiful. where can i find it? I love cincinati zoo/cats.....David conley of marion OH. These pictures are incredible! I went to the zoo for the first time and I was amazed. Thanks for sharing your photos. Sorry LE Barnes, I can't help you. Who has charge of the Zoo ICams of the gorillas and rhinos thru Time Warner? Loved keeping a day-to-day watch of the new baby gorilla . . . now nothing. i love the pics of the animals. i love the cincinnati zoo! I was looking to see if you had any pictures of Colossus (moved to the Cincinnati Zoo in 1993. He died April 11, 2004, at age 40), I worked at Bensons Wild Animal farm when he arrived there as a baby. His name then, was Tony. Just curious to see what he looked like at 40. Are they expanding the zoo across the other side of the street, or was that about parking.